WHEELING — While most people were snuggled under their covers in the wee hours of Saturday morning, Jenny Hannan was up and hard at work prepping for Day 3 of the 66th annual Ron Mauck OVAC Wrestling Championships. As a frigid snowstorm set its sights on “The Friendly City,” Hannan kept warm in her hotel room preparing bios and other items for the event, the crown jewel of the area mat season. Hannan has been a familiar face on the dais at WesBanco Arena since Parkersburg South entered the bi-state conference nearly a decade ago. 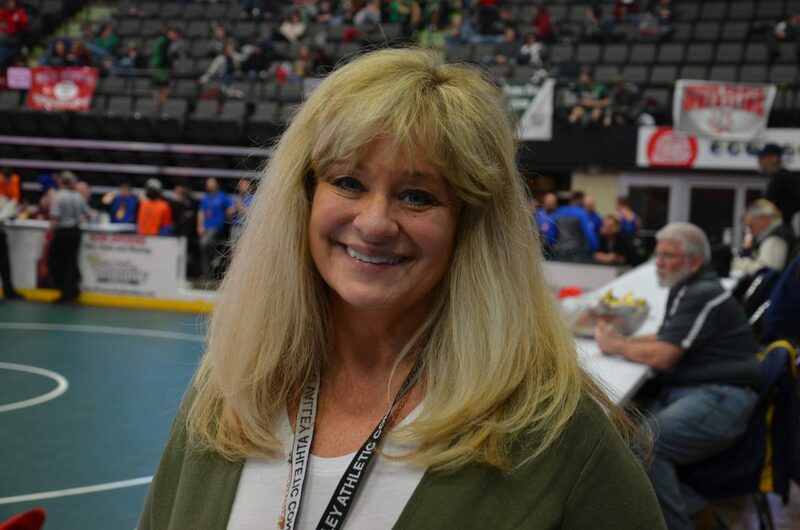 And although she’s officially “retired” as the Patriots’ statistician, being part of OVACs is something she looks forward to annually. “It’s such an undertaking, I’m not kidding,” said Hannan of her OVAC biographical sketch work, which also includes other rounds, including the finals. “I work for eight solid hours writing the semifinal writeups because I do my research. Hannan’s writeups are announced to the crowd before each match and provide some extra flavor to the nation’s largest prep conference wrestling tournament. While Hannan is well-known throughout the Mountain State for her wrestling work, it was baseball that first caught her fancy. “I was a scorekeeper for the baseball team,” she said recalling her days at South, where she graduated in 1979. 1975 marked the first of many state championships for South on the mat. It wasn’t until about 20 years later that Hannan first began her foray into the sport from a statistics standpoint. During the internet’s infancy in the mid 1990s, Hannan came across what was the forerunner what is known today as wvmat.com. Soon, Miller brought Hannan in to contribute to the fledgling site. At about this same time, she started helping South in an unofficial capacity. In the mid 2000s, Hannan officially became South’s statistician, and not long after, started helping with OVACs when the school joined the conference. “When South entered the OVAC, Sean Smith asked me to help do write-ups for the semis and finals at the tournament,” Hannan said. As the calendar as turned, Hannan has helped with a plethora of roles at he table, while also aiding the South team and contributing to wvmat. In 2009, Hannan received the Snyder-Miller Media Award, presented by West Virginia wrestling coaches. “That was a real nice surprise,” she said of the honor, which she received at the state tournament in Huntington. For the past 21 years, Hannan has worked in the IT department at Ohio University in Athens. That, coupled with her recent marriage, prompted her to reprioritize things in her life. Trying to reduce her stress a bit, she decided to stop travelling to away matches, sans OVACs, the state tournament and the regional, if it’s in Parkersburg. Computers and technology have allowed Hannan to do many things at home that, years ago, wouldn’t have been possible. That’s allowed her to spend more time with her husband, Ron, and mom. Hannan believes she’s finally found the perfect balance in her life, giving her the best of family and sports.